Marimo, sometimes called moss balls or marimo balls, are a popular aquatic pet. While not an animal, many people keep them as pets due to their cute nature and easy care. Marimo aren’t a plant either. They are made of a type of cladophora algae that is rolled into balls by wave action (or by hands in captivity). This algae is very slow growing and will not spread to the rest of your aquarium. They grow approximately 5 mm (0.2 in) per year, so there is not threat of it taking over your tank. Marimo can live for a very long time. They grow continuously and at the same rate. 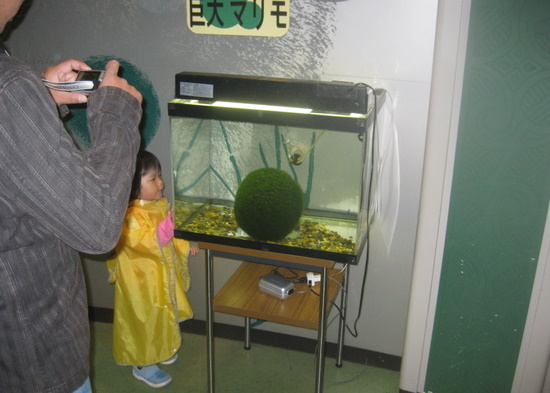 The largest marimo is 95 cm (37 inches) in diameter. Given their growth rate, it is over 200 years old. Most marimo in home aquaria only reach 20–30 cm (8–12 inches). You can find them sold anywhere from 5 mm (0.2 in) up to 10 cm (4 in). The larger the ball, the more expensive it will be. In the wild, marimo are only found in lakes in higher latitudes. Colonies are known to exist in lakes in Japan, Scotland, Iceland, and Estonia. Two lakes in which they occur—Lake Mývatn in Iceland and Lake Akan in Japan—are protected by law. The colonies in Lake Akan are known to grow the largest and most rotund marimo. They live between 2 and 2.5 m (6.5 and 8 feet) deep where gentle wave action turns them over, keeping their cute ball shape. Marimo are not the only form of Aegagropila linnaei. It will grow on the shaded side of rocks in an epilithic form or free-floating filamentous form that can form a carpet on the muddy lake floor. When small filaments of the algae get rolled into balls, they take the marimo form. These balls do not have a hard center and are algae all the way through. As long as the marimo is covered in water, the tank size doesn’t matter. 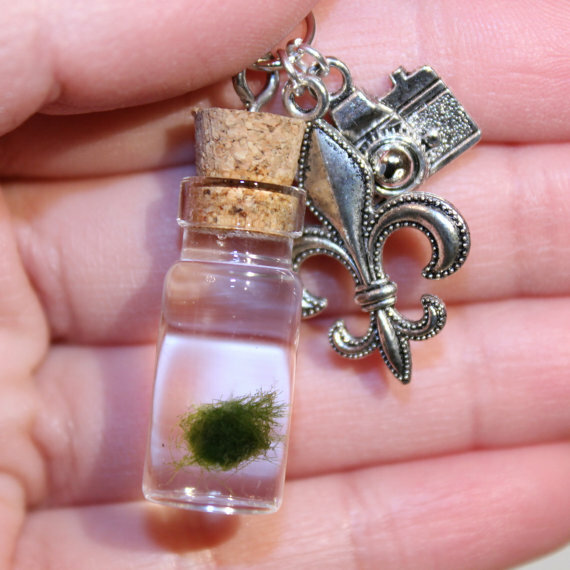 Nano marimo (5 mm or smaller) can actually be housed in containers small enough to hang around a necklace. As the marimo grows it will need a larger container. You don’t even have to keep them in traditional aquariums with filtration as long as you change the water periodically. Water movement is also not necessary. Decorative vases can be used as well as mason jars or anything that holds water. They can be kept in closed jars as long as you open the top every once in a while to let some fresh air in. Coming from high latitudes, marimo prefer cooler temperatures. They can handle temperatures up to about 78F (25C). Above that their growth can be affected or they can fall apart. When the water temperature begins to get this high, consider moving your marimo’s home to a cooler part of the house and change the water more frequently. Even though they come from cool lakes, marimo cannot take freezing temperatures. Protect them from frost. Unlike fish whose waste products (carbon dioxide and ammonia) are harmful to their health, marimo’s waste product (oxygen) isn’t harmful. But they do need periodic water changes to replenish the minerals in the water taken from photosynthesis. It is also recommended to change the water more often in the summer to help keep the marimo cool. When you change the water, you should remove the marimo and give it a gentle rinse in cool water. This will wash away any particles that may have attached to it. Roll it gently in your hands to help it maintain that cute ball shape. Marimo are unfussy when it comes to water parameters. A pH between 6 and 8 will suit them just fine. They will grow and flourish in just about all levels of water hardness. Interestingly, they can also take brackish water (to learn more about brackish aquariums read this article). In Lake Akan in Japan the filamentous form grows abundantly where salty water from natural springs flows into the lake. Sometimes a pinch of salt will help marimo recover when they have brown spots. Marimo are algae, and algae operates much the same way as plants. They get their food from the sun. The only thing you need to give your marimo is light. A simple desk lamp will do. Indirect sunlight like that from a north eastern window (in the northern hemisphere) is good. Avoid long hours of direct sunlight as marimo can get too much light. Any type of substrate is fine for marimo. People keep them on everything from sand to bare-bottom tanks. However, some people have found sand can get tangled in the threads of algae. I had a similar experience with my marimo and sand, and now I use large gravel or bare-bottomed tanks. Given the right-sized aquarium almost any fish makes a great companion for a marimo. Fish that eat algae like plecos, mollies, and hillstream loaches will not make good companions because their grazing on the marimo will likely outpace the marimo’s growth. The few fish that require temperatures regularly over 80F like discus will also be a poor choice for a marimo. These beautiful golden fishies are often seen with marimo but not always in proper homes. Despite what seems to be everywhere, goldfish do not belong in bowls. You can read more about why they don’t belong in bowls in my goldfish care article. Even when placed in a large enough aquarium, goldfish aren’t the best companions for marimo as goldfish are known plant-muchers. They love soft plants and algae. Marimo are usually at the top of their list. Most goldfish will tear apart marimo. There is the odd case where a goldfish doesn’t eat a marimo, but why take the risk? My marimo wrapped in twine to regain their shape after they lived in the goldfish tank. 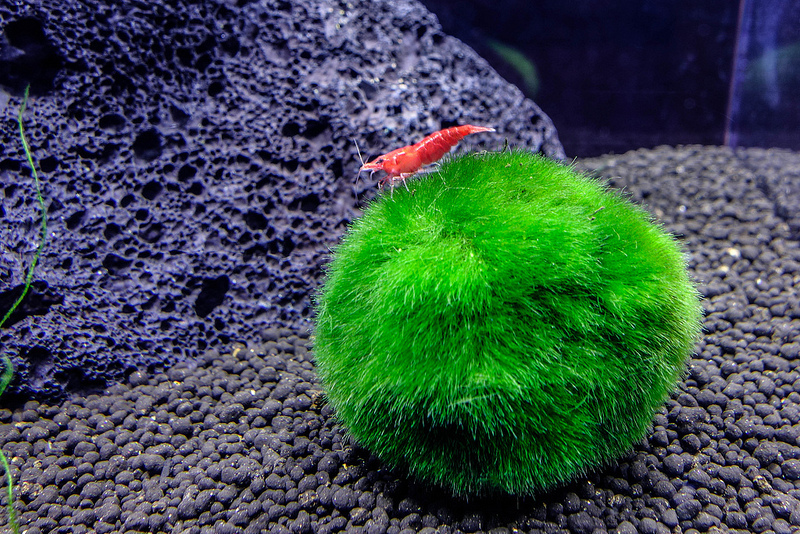 Sometimes known as Siamese fighting fish, these little beauties are another common marimo companion. Like goldfish, they are often put in bowls but are not happiest there. You can read about why in my betta care article. Betta are another iffy choice for marimo as their temperature ranges only overlap a bit. Some people claim it doesn’t matter for the marimo, but others think it does. It might depend on the marimo. Some can take the warmth and others can’t. If you do choose a betta to be your marimo companion, be sure to have a backup plan in case your marimo can’t take the heat. Now that I’ve established some not so great fish choices, I’m going to give you a few species of common fish that have a better potential to work with marimo as they like the same cooler water and won’t munch on marimo. All of these fish need an aquarium larger than 10 gallons, and some will need a larger tank. For groups of fish fish look into zebra danio, neon tetra, glowlight danio, guppies, and white cloud mountain minnows. These fish are shoaling species which means they need to be around 6 or more of the same species. For a more solitary companion an axolotl is a good choice. They are actually a salamander not a fish, but they like the same low-light, cool conditions that marimo thrive in. You should research the needs of any fish you decide to keep with your marimo. While shrimp eat algae, marimo are not on their dinner menu. Red cherry shrimp and ghost shrimp are two of my favorite shrimp commonly available. As their name implies red cherry shrimp are more vibrant than ghost shrimp. But red cherry shrimp will breed and may overpopulate a small tank. Ghost shrimp are much less likely to breed. They also grow larger than red cherry shrimp. Both shrimp love to graze on the bits and pieces that get trapped on a marimo and make great marimo companions. Another good choice for marimo are snails. These invertebrates eat algae but again marimo are not on their menu. Small snails like pond snails, ramshorn snails, and Malaysian trumpet snails do well in small tanks with marimo. Large snails like apple snails, mystery snails, and rabbit snails will need an aquarium larger than 5 gallons as well as supplemental food. Unlike the small snails, large snails can’t survive on the bits and pieces of debris around the aquarium. Marimo are of great cultural importance in Japan where they have been declared a national treasure. Their name comes from the Japanese language and means “bouncy water plant.” When they were declared a natural treasure in 1921, people came from all over to collect and sell them as souvenirs. As a result the population in Lake Akan declined. It was dealt a further blow when a hydroelectric power plant was built along the Akan River which flows from the lake. The level of the lake dropped and hundreds of marimo were left stranded and dying in the exposed shoreline. The local people recognized the treasured marimo was in trouble and launched a massive effort to protect them. An appeal went out to the people of Japan to return their marimo to the lake, and they responded in droves. The locals were so overjoyed by the effort of the people of Japan that they held a festival to celebrate the generosity of the people. 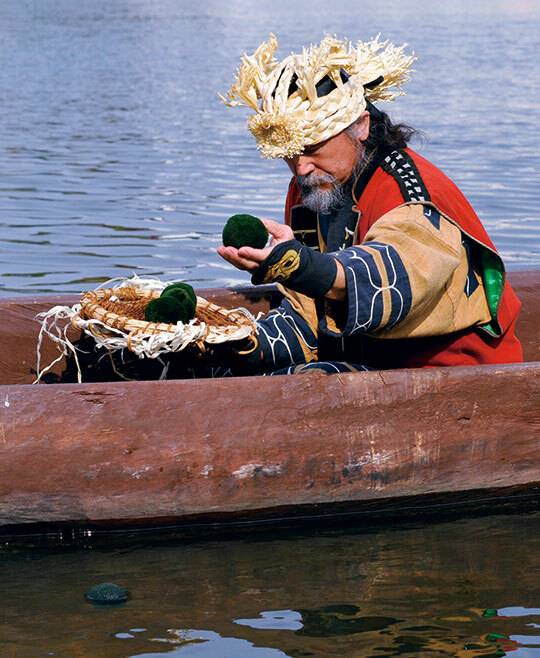 The three-day annual marimo festival continues to today in Hokkaido. One of the popular items in and around Hokkaido is an anthropomorphic version of marimo called Marimokkori. San-X also created Marimoko, a smiling plushie marimo. Around Lake Akan there is a famous legend about the origin of marimo. It says the daughter of a chief of a powerful tribe living on the banks of a lake fell in love with a commoner, but her parents objected to the relationship. To be together, the couple gave up all of their possessions, ran away together, became marimo, and lived happily ever after. For this reason, marimo symbolize love in Japan and are often given as gifts to loved ones. It is believed that if you take good care of a marimo, it will bring you happiness and good luck. "Marimo and Lake Akan." Japan Atlas. Updated: 20 Febuary 2013. Accessed: 25 October 2015. "Marimo Balls." Aquariadise. Updated: 13 May 2013. Accessed: 25 October 2015. "Marimo Care." Buy Marimo. Updated: 2014. Accessed: 25 October 2015. "What is a Marimo." Marimo Sanctuary. Updated: 20 October 2015. Accessed: 25 October 2015. Hi Izzy! I was really looking through a lot of blogs pertaining on fishkeeping and found yours, you seem to know a lot about fish in general so I'm hoping you can give me advice. I was wondering if you have ever experienced your fishes turning into red? 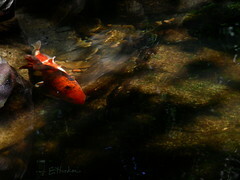 You see I have Koi fishes and I noticed some of them have red spots or red linings in their scales. I know this is a sign of sickness in fishes but I can't really point directly what's causing it. So I immediately change the water and clean the filter and looked up online on what could possibly caused this and read that it could be a parasite/stress/poor water quality. So I decided to separate the ones that are sick from the ones that aren't (don't have the red spots). It's 3 days now since I did the separation but unfortunately the ones that are sick seems not improving despite me putting methylene blue and a little pinch of salt and worse, 2 of them died today. I tried looking for articles pertaining on the symptoms and treatments but unfortunately I couldn't find a solid answer on how to treat it or is there any medications/formula for it. So I was hoping you can give me an advice. Hello! I'm terribly sorry to hear that your fish are sick. You are right that the red spots mean stress. Firstly, you'll want to rule out water quality as the cause. In order to do that you need to make sure the ammonia and nitrite readings are 0. When you have ruled out water quality, then you can start looking for other causes of stress such as a small tank. In the meantime, I don't think methylene blue will help as it is most commonly used on fungus. However, I would keep the salt in the water as it does help with stress short-term. Hope this helps!